Last weekend it was cool, gray, misty. We took a two hour stroll along the beach at low tide. It was perfect. The fog was comfortable and comforting. In the pewter light a father and his young daughter were picking up shards of weathered glass from the sand. We looked over their handful. “It’s sea glass, ” he said. Sea glass? These bits have a name!? A name yields knowledge. When I got home looked up sea glass. Aha! There are books. There are collectors. There’s a national association of collectors. And standards for colors. There’s a annual convention of sea glass collectors and trade show (next one is in Delaware in October). There are enthusiasts, professionals, feuds. 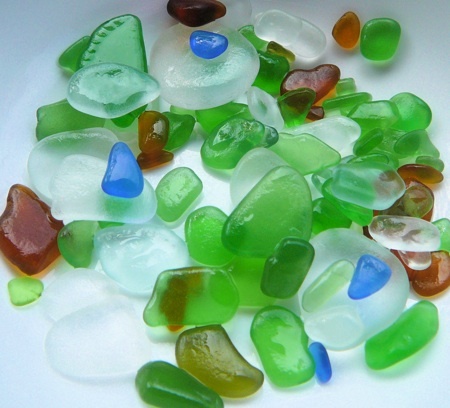 Anything of perceived value will have fakes and counterfeits, and sea glass has those too. Maybe this network existed before the internet, but I doubt it. Most sea glass found is decades old, taking years tumbling in the waves to smooth to a satin finish. So sea glass has been found forever. But before the network age it was a secret discovery, a private hobby. Collecting it was a quirk. Now chips of broken glass is a sub category in the long tail. It is an activity tracked by the One Machine. In the goodness of time, the web will embrace even the smallest thing we give our attention to. If chips of broken glass don’t escape the web’s gaze, what can? Sea Glass? You bet! You hit the nail on the head with your comments on the great info machine, the WWW. Now, folks can share their passions (positive passions, hopefully) with other like-minded people, whereas before, there wasn’t any way to do this. 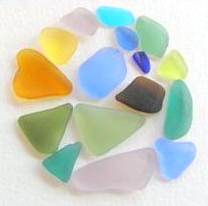 Over 2800 members sharing 11,000 sea glass and beach photos, craft and display ideas, shard id, Sea Glass Anatomy, Sea Glass Color Wheel, beach locations and so SO much more! Membership is open to all and we are a Non Jewelry and Non Agenda site.